Outdoor functions failed after 7 days. Resets and new batteries did not restore outdoor functions. Returned to Costco. Thank you for your feedback. We apologize the sensor failed in such a short time. Your item would have been covered under the 1-year warranty, but we understand that you did return it. We hope you have found a unit that suits your needs or hope to service you better in the future. "Actuate, bright and colorful "
So far the product has been accurate and has stayed connected to the sensor. The time stays correct too. This product I would recommend to someone that is in to weather. Numbers and letters are big and easy to read. Good gift for any occasion or just to buy. 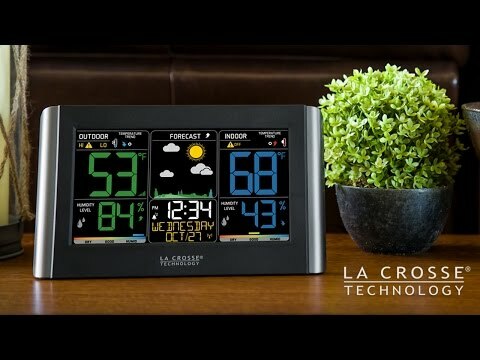 I purchased the unit mainly for the "Atomic" clock and outdoor temperature. After setting up the unit I place the remote directly behind the base, over the course of two days the indoor and outdoor readings were never close... I might expect some difference, but not what I was getting... Is this a design issue or is my unit defective? Thank you for your inquiry. We apologize you are having problems. We know we can fix your unit but additional trouble shooting is needed. Please contact Technical Support via the Support Tab web form link or contact them directly M - F 8 AM to 6 PM CST at 608-782-1610/888-211-1923.